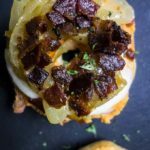 These Mini Bagels are topped with cheddar cheese, tart sliced apples, sweet caramelized onions, and everyone's favorite....BACON! Add the onions and butter in a saucepan. Heat over medium low and stir periodically until onions are caramelized, about 20 minutes. Slice and toast the mini bagels until they are lightly browned. Spread the cheese on each bagel half. Add several slices of apple and place about 1-2 tbsp. of caramelized onions on top. Top with the crumbled bacon and serve. Makes about 15 bites. Recipe can be doubled or halved as needed. You can also make these sliders by adding the tops on to make a sandwich. Consider drizzling with honey for an added sweet treat. It complement the bacon well. Once you've opened the package, the cheeseball will keep for about 10 days. I don't recommend making the bagel bites ahead of time as they will become soggy. The caramelized onions can be made ahead of time for quick assembly. Once made, store them in the fridge for up to 3 days. Warm them in the microwave before serving.